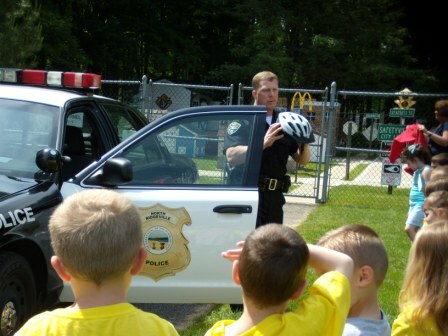 Safetyville is sponsored by the North Ridgeville Police Department as a community service program, and provides an educational setting in which children receive instruction in various safety issues. Five and six year old children are taught safety skills with regard to traffic, school bus, bicycle, and pedestrian activity, as well as ""Stranger Danger,"" the use of the 911emergency system, drug and fire safety. 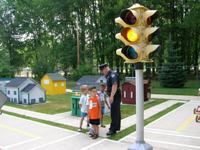 The program utilizes toy vehicles in a unique miniature village, in which the children are taught these safety skills in an enjoyable and realistic environment. Det. Adam Freas has been conducting the Safetyville classes since 2003, with the assistance of several elementary school teachers from the North Ridgeville City Schools. Safetyville is conducted in the month of June. Cost is $25.00 per child. For more information, contact Patrolman Calvin Cross at (440) 327-2191.